Chilling food helps prevent harmful bacteria, such as salmonella and listeria, from multiplying to dangerous levels and causing food poisoning. It also slows the natural deterioration of fresh meat, fish, fruit and vegetables, helping them last days longer than they would at room temperature. 1. Keep your fridge temperature at 5C or below. Most fridges are warmer than you think. 2. When preparing food, keep it out of the fridge for the shortest time possible. 3. If you’re having a buffet, keep the food refrigerated until you’re ready to serve it. 4. Cool down leftovers as quickly as possible (ideally within 90 minutes), store them in the fridge and eat them within two days. 5. Store eggs in their box in the fridge. 6. Never put open cans in the fridge, as the metal may transfer to the can’s contents – place the contents in a storage container or covered bowl instead. 7. Make sure food has cooled down before you put it in the fridge. If the food hasn’t cooled down, it will raise the temperature in the fridge, which can then promote bacterial growth. 8. It is safe to let food cool completely before storing it in the fridge, so long as basic food hygiene is applied to avoid cross-contamination. When re-heating food, make sure to cook until steaming hot. 9. 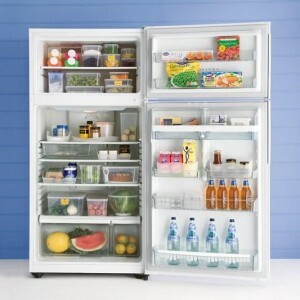 Clean your fridge regularly to ensure it remains hygienic and in good working condition. 1. Cool foods before you freeze them. Freezing food when hot will only increase the temperature of the freezer and could cause other foods to start defrosting. 2. A full freezer is more economical to run as the cold air doesn’t need to circulate so much, so less power is needed. If you have lots of space free, fill plastic bottles half full with water and use them to fill gaps. Alternatively, fill the freezer with everyday items you’re bound to use, such as sliced bread or frozen peas. 3. It’s a wrap. Make sure you wrap foods properly or put them in sealed containers, otherwise your food can get freezer-burn. 4. Portion control. Freeze food in realistically sized portions. You don’t want to have to defrost a stew big enough to feed eight when you’re only feeding a family of three. 5. If in doubt, throw it out. Contrary to what many people think, freezing doesn’t kill bacteria. If you are unsure of how long something has been frozen or are a bit wary of something once defrosted, don’t take any chances. 6. Stay fresh. You get out what you put in as freezing certainly won’t improve the quality of your food. Don’t freeze old food because you don’t want to waste it; the point of freezing is to keep food as its prime. 7. Friendly labels. It may seem a bother at the time, but unless you label you might not remember what it is, let alone when it was frozen. Buy a blue marker for raw foods and a red marker for cooked foods. You don’t have to write an essay, just label the food clearly. You can use big-lettered abbreviations, for example a big red P means cooked pork or a blue F means raw fish. And always add the date it was frozen. 8. Defrosting is a must. An icy freezer is an inefficient one, so make sure you defrost your freezer if ice builds up. Don’t worry about the food; most things will remain frozen in the fridge for a couple of house while the freezer defrosts. 9. In an emergency… If there has been a power cut or you think the freezer has been turned off at some point, don’t open the door. 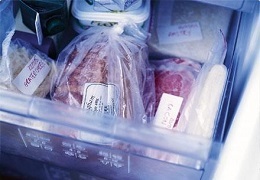 Foods should remain frozen in the freezer for about 24 hours, leaving you time to get to the bottom of the problem.